A Trinamool Congress leader said the decision on who should be the prime minister should only be taken following a discussion among Opposition parties after the Lok Sabha election results were announced. He added that any unilateral announcement could send out a wrong message. The BJP had mocked the opposition meet and said they should first declare a prime ministerial candidate. 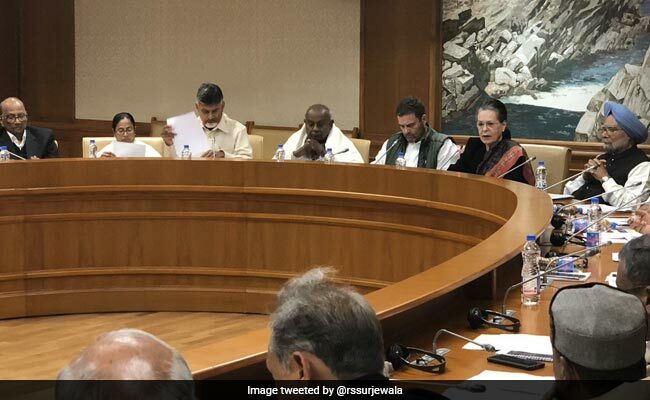 A day after DMK president MK Stalin proposed the name of Congress chief Rahul Gandhi as the prime ministerial candidate, the TMC leadership on Monday distanced itself from the statement, saying any such announcement would be premature. "Not only TMC, but other Opposition parties, too, are of the opinion that any decision on the PM candidate should be decided only after the Lok Sabha election results. Any announcement on the PM candidate right now would be premature as it would divide the Opposition camp," a senior TMC leader told PTI on condition of anonymity. Mr Stalin had on Sunday made a strong pitch for the Congress chief as the prime ministerial candidate of the Opposition, saying the Gandhi scion had the ability to defeat the "fascist" Narendra Modi government. Top leaders of 21 Opposition parties, barring the Bahujan Samaj Party and the Samajwadi Party, had met in New Delhi last week and vowed to forge a united front to fight and defeat the BJP in the 2019 general election. The Bharatiya Janata Party had mocked the meet and said they should first declare a prime ministerial candidate before thinking of ousting the Modi government.